At Letitia I put the lift out, saying goodbye to a couple I haven’t seen in some years. He’s a Vietnam vet with a summer job transporting convicts between different prisons cross-country. She remembers me from the 5 and likes my attitude. They’re on their way to the hospital and the bank. A woman’s been watching from the chat seat. “Is the next one Mount Baker,” she asks. She had moved up to the front at Genessee, calmly, no rush. A rare Caucasian passenger on this corridor, I’m thinking thirties, some sort of European descent, dressed in a ponytail and women’s business casual, a trim collection of grays and tailored lines. Demure. “I will!” I say, pulling up to Martin Luther King Way. “Congratulations again,” I say as she’s getting off. “You have the glow!” I emphasize the line with a hand gesture, hoping she knows what I mean. I suppose I meant the glow of being pregnant. Sometimes we find people who absolutely radiate vitality–it seems almost reductive to call it positive energy, though I guess that’s what it is. They might be pregnant, or engaged, or children, or just those rare souls whose well-being explodes out of them for reasons too large to decipher. A young man once got on my 70 so overwhelmed with joy he rode to the terminal just so we could finish talking about it, parsing it out in words, attempting to solve the mystery. He’d been torn up over the loss of his girlfriend for six months, and today he had a conversation at a “combination tanning salon slash video store,” chatting with the owner about the history of the establishment. The owner was pragmatic in a humorous way: people like suntans, and they also like videos. There you go. Throughout the City of Seattle, residents are seeing their neighborhood streets besieged by free-loading, scofflaws, also known as pedestrians. The crux of the problem is that Seattle is facing budget woes, large areas without sidewalks and 634,535 residents that don’t pay their fair share towards the problem. Fortunately, a new group has stepped forward advocating for change, Concerned Seattlites for Safe Sidewalks, Pedestrian Regulation and Stopping Sadness (CSSSPRSS). CSSSPRSS representatives note that other forms of transportation pay their fair share, such as transit riders through fares and motorists through the gas tax, but pedestrians don’t pay anything towards the maintenance and upkeep of sidewalks. This explains why so many sidewalks are cracked and in dire conditions. Beyond wear and tear, there are further issues with pedestrians. If you’re a motorist, you are likely familiar with the common problem of pedestrians impeding your right-of-way, crossing against the light or jaywalking. Not only do the seconds lost from these activities likely add up to minutes, but everyone bears the cost of healthcare for scofflaw pedestrians. The benefits from licensing pedestrians is bigger than helping solve these problems though. If every pedestrian is licensed, it will finally be possible to require all pedestrians to hold walker insurance. This will mitigate the vast costs from things like drunk walking. While licensing pedestrians may seem unusual, licensing for all types of things is common, especially transportation modes. As James Vesely points out at the Seattle Times, “Special licenses are not new. We license dogs, our cars, our boats, our motorcycles, our pleasures in hunting and fishing, as well as many other outdoor activities.” While the cost of all the undocumented pedestrians in Seattle is obvious, naysayers suggest that it would be impossible or unprofitable to implement. The CSSSPRSS has a plan though. Implementation would be relatively simple. Since all Seattle residents are potential pedestrians, Seattle Department of Transportation (SDOT) could send a letter out to each address in the city annually. Citizens would be required to reply to the letter stating how many people live in the house and return a small, $10 dollar fee for each pedestrian. In order to ensure enforcement, all citizens would have to return the fee unless they affirmatively petitioned the City and proved that they never used sidewalks. Upon receipt of the fee, the city would send a small license plate attached to a necklace back to the citizen. It would be necessary for each citizen to wear this while walking around so that the police could reasonably tell the difference between law-abiding, registered pedestrians and rule-breakers. This would be especially useful in situations like pedestrian critical mass, commonly seen around Westlake Mall during lunch time. Unfortunately, pedestrians aren’t the only problem on our sidewalks. The especially egregious free-loaders are those that have pets and strollers. Strollers add to the wear and tear of our sidewalks. Since this is especially common in Ballard, it would be best to have an additional stroller fee in that neighborhood. Lastly, Seattle hosts a lot of tourists who also aren’t paying their fair share. In order to ensure their contribution, it will be necessary to require all Seattle visitors to register with the SDOT and pay a small fee before they are allowed to use sidewalks. Many people might object that this would be confusing to tourists and it’s unlikely they would comply. On the contrary, it’s likely many people would hear about the law before coming to Seattle because it would be the only city in the country with this policy. If non-compliance became a problem, all the City would need to do is throw a few tourists in jail to make a point. CSSSPRSS points out that now is a unique opportunity for this novel solution. With the upcoming City Council elections in 2015, CSSSPRSS points out that Council will feel pressure if citizens take action. Considering the overwhelming power of the pedestrian lobby, it’s important to act diligently and timely. It’s likely there will be push-back from militant pedestrians. The most effective contribution you can make is to publicly support this initiative by notifying news affiliates. We encourage you to email the following media organizations. It is clear that Seattle has a sidewalk crisis. There aren’t enough sidewalks. They are in terrible disrepair. There are too many free-loading, scofflaw pedestrians. Requiring pedestrian licensing would help address the city’s budget problems, raise money for sidewalk maintenance, require everyone to pay their fair share and help the city track and punish pedestrians that break the law. This issue hasn’t received enough coverage and I strongly encourage you to provide the time it deserves. 2013 Design Block by Trevor Dykstra on Flickr. The Seattle Design Festival, now in its fourth year, celebrates the ways design makes life better. Every September, Seattle’s citizens, city leaders and design experts come together at workshops, tours, talks, films and gatherings to exchange ideas. We believe that the more we work together, learn from one another, share information, discover new processes and remix solutions, the more Seattle will benefit as a whole. Our city is stocked with talented designers who bring their skills, knowledge, passion and design-thinking to help (re)solve chronically stuck problems in our community. The Seattle Design Festival is the unique brainchild of Design in Public, a local non-profit sponsored by Seattle-area art, media, and architecture organizations. While there is a kick-off party Friday where you can rub shoulders with local designers, the real fun begins Saturday. Occidental Park will host the SDF2014 BLOCK PARTY, a two-day, interactive event in the park. It’s a fun event for all ages that showcases the innovative products of local organizations. For a full list of venues, check out the online program list for topics, dates, times, and locations. Design in Motion will run from September 5 through September 19. Image: (left) Where to access StopInfo within the OneBusAway iOS Application. (right) StopInfo’s information screen. Many people rely heavily on visual cues to navigate their environments. In the case of locating transit stops, particularly those in unfamiliar areas, this can involve scanning for the proper sign and identifying other transit-associated landmarks such as shelters or card readers. But for visually impaired transit riders, locating stops is often a challenge. Which corner of the intersection is the stop closest to, and how far down the street is it? Is it located on an island? Is the bus sign close to the curb or away from it? Having access to this type of information ahead of time or while navigating to the stop can help. This is one of the primary goals of StopInfo, a prototype system that can be found on the Web and in the transit application OneBusAway on the iPhone (see image above). StopInfo presents information such as stop position relative to the intersection, whether there is a bus shelter, what type of sign is present and how far from the curb, as well as what other physical objects (such as trash cans and benches) are around. For visually-impaired pedestrians using a white cane, advance knowledge of what landmarks are present at a certain bus stop can help them know what to search for, while positional information can let them know approximately how far they should expect to travel from the intersection. But this information is not only useful to the visually-impaired. Information such as how well-lit the stop is might help people travel more safely and confidently at night. Displaying whether a stop is temporarily or permanently closed can also be useful for all people using the app. One of the more novel StopInfo features is how the information itself is collected. 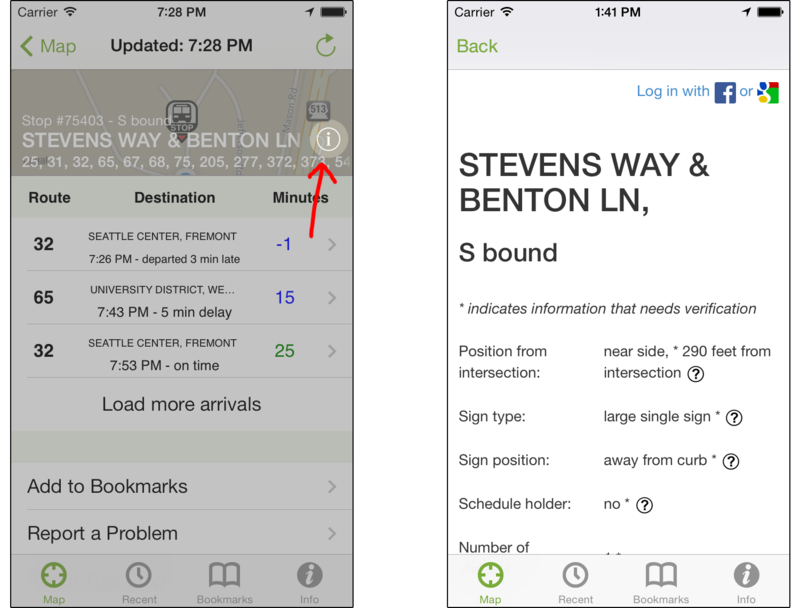 While the starting information comes from King County Metro’s database, anyone using OneBusAway on an iPhone or the StopInfo website can add data that Metro doesn’t track. Since the initial launch of StopInfo in late February, we have collected over 1,300 submissions for 845 unique stops in King County. We have also studied the use of the system with six visually-impaired transit riders over a five-week period. We found that StopInfo is generally helpful for blind and low vision riders and that it can promote more spontaneous trips, often to less familiar places. Additionally, all six of our participants said that they wanted to keep using the system even after the study ended. Full details on this study can be found online. The study will be published and presented at the Association for Computing Machinery’s Special Interest Group on Accessible Computing annual conference in October. We are now in the midst of evaluating the system more fully, and are considering the underlying values associated with it for a full range of stakeholder groups. These groups include transit officials at King County Metro, visually impaired transit riders, bus drivers, and transit riders who might potentially contribute information. So, if you are a Metro driver, a person who is blind or low vision, or are interested in potentially contributing information or have contributed information before, please contact us at stopinfo@onebusaway.org. If you are a OneBusAway user interested in contributing, you can also take a quick online survey, which offers a chance at winning a $50 Amazon gift card in a drawing. We encourage transit riders in the King County area to submit information about bus stops as they wait for the bus. It’s easy to do by using StopInfo on iPhone or in a mobile browser for other smartphone platforms (we are working on incorporating this feature into other versions of OneBusAway soon). We are also working with Metro on ways to reward our top contributors to the application. For more information, or if you have questions or comments, you can read our article on StopInfo, contact us at the e-mail address mentioned above, or reply to this post. Thank you! There was a time when Sound Transit provided frequent and comprehensive progress updates for University Link tunneling. We would love to see those updates come back. It gives us something to write about… and it’s fun to watch the progress of these projects that our region so vitally needs! CHS North Entry Remove Formwork by Sound Transit on Flickr. As of July 30, Sound Transit’s University Link Extension project was 87.2% complete, up 2.6% from our last update. And the Northgate Link Extension project (formerly known as North Link) has been rapidly proceeding, too. In this project update, we’ll share some statistics and details about the significant progress that Sound Transit has made, including station box work at all sites under construction, tunneling work from Northgate, and movement of the Capitol Hill crane. Capitol Hill Station saw the big red crane come down in mid-August. The crane was promptly redeployed to the Roosevelt Station construction site. Sound Transit anticipates that the crane will remain in Roosevelt for the next two years, in order to move equipment and supplies in and out of the station box. Meanwhile, work at Capitol Hill Station continues with construction of the station box. As you can see above, station walls have been constructed above ground. These are partially viewable from E John Street. As of July 30, Sound Transit reports the station as 64.5% complete. The University of Washington Station is almost done (96% complete). The pedestrian bridge over Montlake Boulevard, and related station access construction, have recently been Sound Transit’s main focus. The access project has led to months of lane closures, bicycle detours, and re-grading work in and around the Montlake Triangle area (the triangle island landmass fronting on to Pacific and Montlake). But from the looks of it (see below), the pedestrian bridge across Montlake is nearing completion. The University of Washington must finish their part of the project by connecting Montlake Triangle with the Rainier Vista mall, which is due in early 2015. For the tunnels themselves, the primary focus has been track, power, and safety system work. 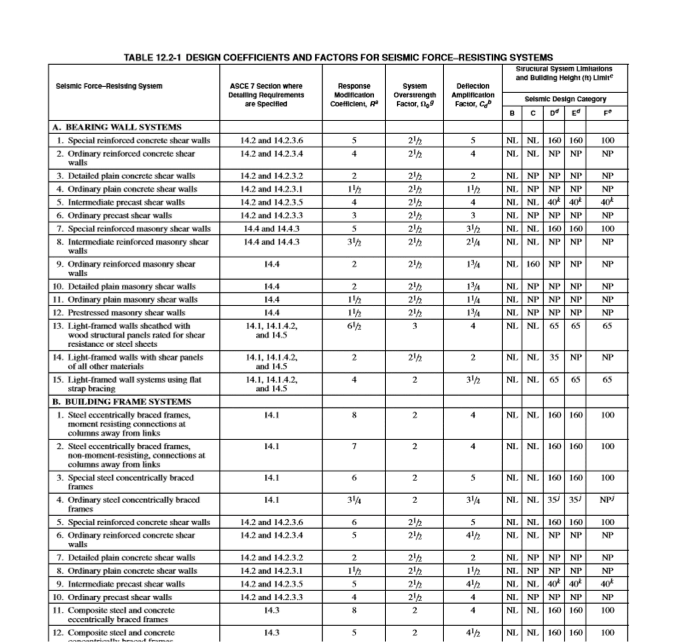 Sound Transit reports that the tunnels are 43% complete. Construction at the University District Station has moved on from drilling and pile driving (which your correspondent felt and heard from his apartment) to digging. Sound Transit reports that 230 pillars were driven into the ground, ranging from a depth of 40 to 120 feet, during the drilling phase. These pillars were then reinforced with support beams, concrete shells, and rebar. Now that the site has been sufficiently secured (as a result of all pillars being driven into the ground), the station box can be excavated and the station walls can be shored up. These walls will form the shell of the completed station. The excavation for the station will reach 95 feet underground, and work will continue through the spring of 2015. Just to give you an idea of how quickly the tunneling work is going, Brenda (the primary Northgate Link Extension tunnel boring machine, and not to be confused with Bertha!) was launched from the Maple Leaf Portal in May July, and has already traversed more than 1,600 feet. Sound Transit estimates that Brenda will reach Roosevelt Station early in 2015, after having traveled a total of 1.5 miles. (Luckily for the future riders of the Northgate Link Extension, Link trains travel more quickly than tunnel boring machines.) Another tunnel boring machine is scheduled for launch from the Maple Leaf Portal in a few short months. All tunnel boring work on Northgate Link should wrap up in 2017. The twin-bored tunnels will connect Northgate, Roosevelt, University District, and University of Washington Stations, at a total distance of 3.6 miles per tunnel. For live camera feeds of these two projects, check out EarthCam’s University Link and Northgate Link feeds. The NC3-85 and NC3-125 zoning designations (Neighborhood Commercial 3, 85-foot/125-foot height limits) are used extensively throughout Seattle. Ostensibly, the goal of NC3 zoning is to create large, pedestrian-oriented, mixed-use commercial districts. But in fact, these two designations are limiting Seattle’s ability to develop, while presenting the illusion that the city has more available building capacity than it really does. It’s important to remember that height is not density. Imagine a parcel of land that is divided into two halves: one half has a one-story single-family home while the other half is vacant. If the homeowner builds a second-story addition and rents it out, they have doubled the density of their property. But if the homeowner simply builds another one-story home on the vacant part of the lot, they have doubled the density as well. Ultimately, the floor-area ratio (FAR)–i.e. the total amount of floor space that a building can have, given the size of the land it sits on–is a much better measure of how dense a neighborhood can get. If this seems weird, think about the opposite: how many 6-story buildings have you seen being built out of concrete or steel? Wood-framed buildings are cheaper and easier to construct, and so developers generally don’t want to use sturdier materials until they have to. Given this limitation, every real estate developer must ask themselves, “Are two extra floors (20 extra feet) worth the hassle of concrete and steel?” For most developers, the answer is “no“. Instead, they choose to buy and develop lots with NC3-65 zoning. The 125-foot height limit (NC3-125) is no better. In all Seattle commercial zones, the FAR limit for mixed-use 125-foot buildings (6.00) is the same as for mixed-use 85-foot buildings. While 125-foot buildings can be taller, they must be skinnier to compensate. Taller buildings can command higher prices for high-up units, but is that enough to recoup the expense of steel or concrete? I’d call that a maybe at best. Only the 160-foot height limit (NC3-160) offers a meaningful improvement over NC3-65. Its FAR of 7.00 is over 50% greater than NC3-65’s max FAR of 4.75. And NC3-160 is nearly 2.5 times as tall as NC3-65, which allows for 7 floors worth of premium-priced high-rise units. Those premium rentals are key in helping the building “pencil out,” even with the added expense of concrete or steel construction. As an aside, it’s worth noting that NC3-160 encourages good urban form in a way that NC3-85 does not. A 6-story building on an NC3-85 parcel can cover 100% of the lot. Too many of these “bread loaf” buildings can create an imposing facade. With NC3-160, if a developer were allowed to go “straight up”, over half of the lot would be undeveloped. In reality, developers follow the pattern used by buildings like Olive 8, with 2-4 stories of full-lot coverage and a skinnier tower on top. This urban form can feel more airy and inviting than full-coverage 6-story buildings, even though it’s actually denser than the latter. While they have good intentions, the NC3-85 and NC3-125 zoning designations simply don’t live up to their potential. Construction costs and FAR limitations will prevent these zones from achieving the high density and good urban form that NC3 is designed for. If we’re lucky, the market will price these parcels at the same rate as NC3-65, and these lots will be redeveloped with needlessly short buildings. If we’re not lucky, then a lot of existing buildings, parking lots and “brown fields” will miss out on the redevelopment that they deserve. Pronto Cycle Share, previously working under the name of Puget Sound Bike Share (PSBS), has secured sponsorships, station locations, and is set to launch on Monday, October 13th. Annual memberships ($85) started being offered this past Monday, with the first signup being none other than Seattle Mayor Ed Murray. According to the Pronto website, the system will open with 50 stations and 500 bicycles through Downtown, Belltown, South Lake Union, Capitol Hill, and the University District. The system will contribute to the city’s diversity of transportation options, but because of its late launch it may be off to a rocky start. When I first reported on Seattle’s incoming bicycle-share back in January the estimated launch was in May. However, in February the system’s supplier went bankrupt and the launch was pushed back to August as a new bicycle was sought. In May I attended a community workshop with Pronto representatives, where PSBS executive director Holly Houser emphasized the system would launch no later than late September. In early August another Pronto employee confirmed September for me. But when membership opened this week, a firm date of October 13th was finally announced.